If you've ever tried to lay out flooring, arrange furniture or had an argument about who gets the bigger bedroom, you already understand the importance of knowing the size of a room. In the U.S., most flooring, furniture and other materials are measured in feet, so it makes sense to calculate the size of a room in square feet. However, if you're looking at furniture or flooring materials – or a potential roommate from anywhere else in the world – you need to calculate the size of the room in square meters instead. To calculate a rectangular room's area in square meters, multiply its length in meters by its width in meters. If the room is an odd shape, break the shape down into individual rectangles, calculate the area in square meters for each rectangle, and then add the areas of all the rectangles for the room's total area in square meters. To calculate the area of a room, you need to know its length and width. Since you want the result in square meters, both measurements should be taken in meters. 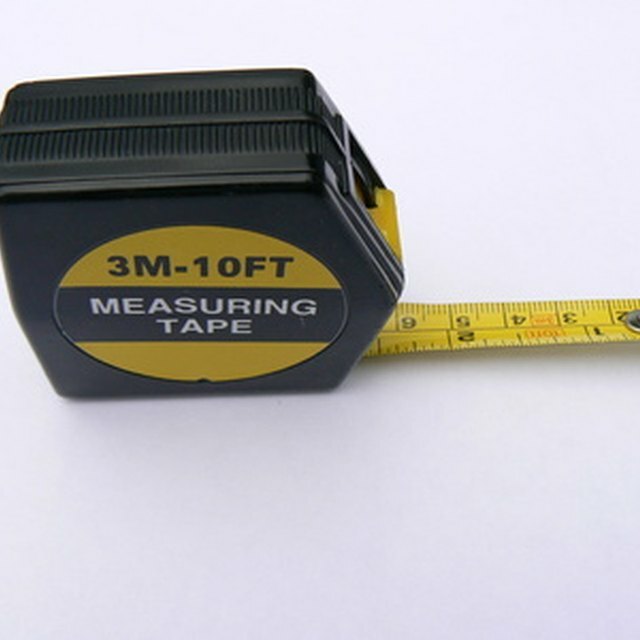 Most measuring tapes have metric measurements along one side, so just make sure you read the right side of the tape and always write down the measurements to cut down on mistakes and to keep from having to remeasure if you forget. If you've already measured the room in feet, you don't have to remeasure. Instead, grab a calculator and make the conversion to meters by dividing the number of feet in each measurement by 3.2808. If your room measures 13 feet long on one side, after the conversion, you have 13 ÷ 3.2808 = 3.96 meters. Now that you know the room's length and width in meters, you calculate its area using the formula length × width = area. If the room is 4 meters long and 3 meters wide, its area is 4 meters × 3 meters = 12 square meters. If the room is 6 meters long and 5 meters wide, its area is 6 meters × 5 meters = 30 square meters. When you multiply one measurement in meters by another measurement in meters, the result should always be labeled as square meters to avoid confusion. You can also write square meters as meters2, which is read as meters squared. The formula works if your room is a square or rectangle shape, but sometimes rooms are L-shaped, or maybe you want to measure the free floor space around the furniture that's already in the room. In that case, the easiest method is to break the room's shape into individual rectangles. Calculate the area of each rectangle in square meters and then add the areas to get the total area of the room in square meters. If you have an L-shaped room that you broke down into two rectangles – one measuring 2 meters by 5 meters and the other measuring 5 meters by 4 meters – the area of the first rectangle is 2 meters × 5 meters = 10 square meters, and the area of the second rectangle is 5 meters × 4 meters = 20 square meters. Add those together to get the total area of the room: 10 square meters + 20 square meters = 30 square meters. Mapei Home: How Can I Calculate a Room's Area? Maloney, Lisa. "How to Calculate the Square Meters of a Room." Sciencing, https://sciencing.com/calculate-square-meters-room-7776820.html. 29 April 2018.